I have been lately thinking why I/we need entertainment? It has its own benefits – Pros and cons. But I am also looking at it from also a business perspective. Here is the mind map image (created using freemind software) – kindly do add to the list in the comments section or by mailing me! If you are not able to see the image fully as I keep changing my presentation style of the blog you can view the image here. Taking it a step further which would you like on your mobile and which ones on the net? Pingback: Vinu’s Online Cloud » blogging helps! im doing a speech on entertainment in the past and im wondering if the picture that you have shown up there applies to the time when henry the eighth was around and stuff????? the $4.50 glass of beer, etc etc. On the other hand, those of us living in God’s country, i.e. scalp us anymore. We have cars and televisions, and oh yeah, we have each other! Thanks for this article/mind map, also, the question is well answered. 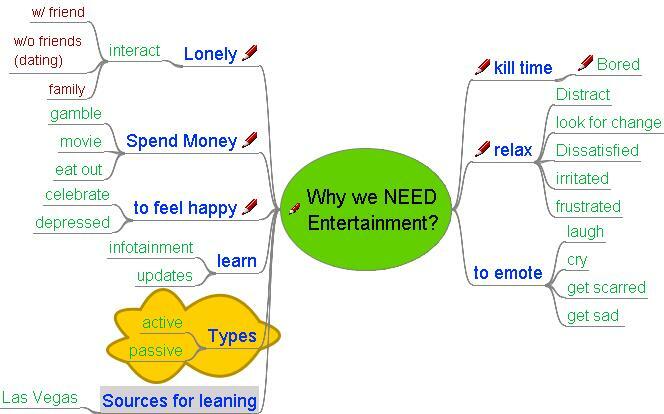 However, I don’t understand the addition of ‘Spend Money’ as a need for ‘entertainment’? Or has it been interpreted wrong? Cause it currently means that ‘we need entertainment to spend money’? Can I simply just say what a comfort to uncover somebody that really understands what they’re discussing on the web. You actually know how to bring a problem to light and make it important. More and more people need to check this out and understand this side of the story. I was surprised you aren’t more popular given that you definitely possess the gift.